Many health-conscious people exercise regularly, and some use sports drinks for hydration. In this post, Yuma Dentist offers a word of caution. 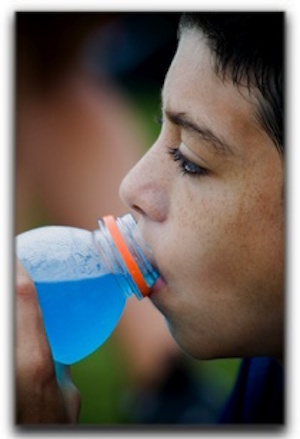 While it’s true that sports drinks help preserve electrolyte levels in the body (and pose fewer health risks than energy drinks), their acidity can erode tooth enamel. And when tooth enamel is compromised, those pearly whites are more staining, discoloration, and decay. Nobody wants stained teeth, so next time you’re at the gym, try substituting water for sports drinks. If you have already noticed staining or tooth discoloration and would like to know more about porcelain veneers or teeth whitening, give The Yuma Dentist a call. We have offices in Yuma and Fortuna Foothills. If your smile could use some brightening, what are you waiting for? 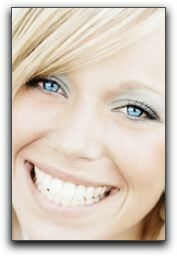 Professional teeth whitening by The Yuma Dentist can dramatically improve their appearance. It is important to realize that not every Yuma smile responds the same to teeth whitening. The degree of whiteness attained and the treatment time necessary depends on the type of stains being treated. 1. Surface or extrinsic stains are the most accessible and easiest to remove. They are caused by the usual suspects: coffee, tea, wine, cola, smoking and the natural aging process. 2. Intrinsic stains can be lightened but it may take a bit longer. These stains form from the inside out but are visible through the enamel. They can be caused by trauma, tetracycline antibiotics, infection, or excessive fluoride use in childhood before the enamel is fully formed. 3. Combination: Some Yuma dental patients have both extrinsic and intrinsic staining. As we age, our teeth change – regardless of how well we take care of them. Two things that work against us is that our enamel thins while the dentin underneath fades and yellows. Again, the extrinsic stains on the enamel are the quickest to lighten, but ongoing treatment with a peroxide-based penetrating whitener can lighten the deeper discoloration. It is best to trust fast teeth whitening treatment to the care of an experienced practice like The Yuma Family Dentist. We also offer dental implants. Schedule an appointment today. One of the best things about the dental profession is interacting with our patients. During initial dental consultations, we listen carefully to each one’s short and long term dental goals. We enjoy discussing options and developing effective treatment plans tailored specifically to each person. Some of our patients desire a total smile makeover. We explain in detail the treatments available including teeth whitening, dental veneers, orthodontia, crown restoration, and dental implants. If a patient is nervous about undergoing treatment, we discuss sedation dentistry. This is a great option for anxious patients. Dental visits do not have to be painful! 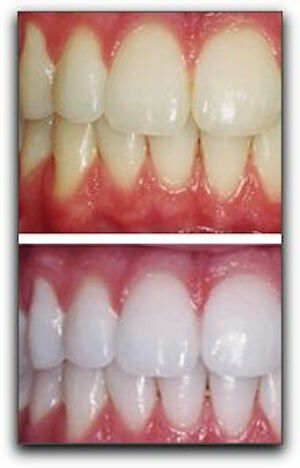 After the treatment has been completed, it is very gratifying for us to see our patient’s reaction to their new smile. If you have been considering a smile makeover, let’s talk about it. Call Yuma Family Dentist to schedule a cosmetic dentistry consultation. This Is The Year For A Beautiful Smile in Yuma! If you are not familiar with the latest dental advances, you might not realize what cosmetic dentistry can do for you. At The Yuma Dentist, we can transform your smile from ordinary into something beautiful. Teeth whitening. In-office teeth whitening far surpasses anything you can get from a toothpaste tube or whitening strips. We use Glo Whitening that uses LED lights to transform your smile. Porcelain veneers. Porcelain veneers can cover crooked or misshapen teeth, or teeth have have become dull over the years. Veneers have been used for nearly a century. Dental implants. Missing a tooth? Dental implants look and function like a natural tooth. Because a titanium post is implanted in your jaw, where a tooth root once was, they have the added advantage of preventing bone loss. 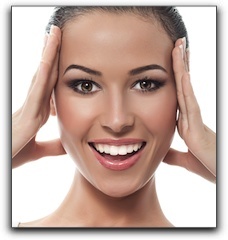 We offer the full range of cosmetic dental procedures to provide you with a beautiful smile. Visit our smile gallery to see what cosmetic dentistry from The Yuma Dentist can do for you. At the Yuma Family Dentist, we encourage all our patients patients to keep up with their oral hygiene so maintain optimum oral health. A happy mouth is not only a healthy mouth but one that can enjoy the flavors of all types of foods. 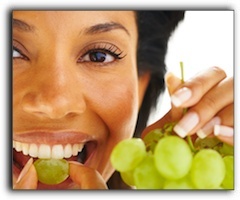 Healthy oral habits benefit our taste buds as well as our smiles. Here are some recommendations to help you better enjoy all the flavors and textures that can make each meal a delight. 1) Treat dry mouth. Dry mouth can create a loss of taste sensitivity, so it should be treated quickly. Adequate saliva is also necessary for avoiding cavities and gum disease. 2) Steer clear of processed food with artificial flavors. They’re high in fat and salt, and will quickly desensitize you to subtle, healthy flavors. 3) Don’t smoke! Cigarettes are bad for a lot of reasons. One that gets overlooked sometimes is that smoking dulls your taste buds. Olfactory nerves can even be damaged permanently from smoking. In addition to healthy teeth and keen taste buds, we want our patients to have the beautiful smile they have always desired. If you have any questions about cosmetic dentistry such as teeth whitening, veneers, or dental implants, please contact The Yuma Dentist. Whitening your teeth is as simple as visiting The Yuma Dentist for professional teeth whitening. We use the Glo whitening system that uses LED lights to whiten your teeth. There are many over-the-counter products that promise to whiten your teeth, and they can be effective – up to a point. Toothpastes, whitening strips, and whitening pens can lighten your smile by several shades. Professional whitening, on the other hand, can whiten your teeth up to seven shades. These treatments penetrate your teeth to remove deep and surface stains. Your teeth get dull from years of what most of us normally eat and drink. Coffee, tea, and soft drinks are among the substances that stain teeth the most. So once you have had your teeth professionally whitened, it’s best to be careful with what you consume, so your teeth don’t get discolored again. 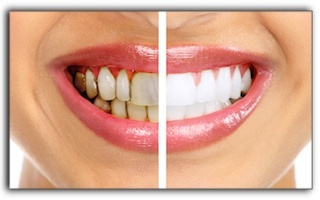 At The Yuma Dentist, we offer safe and effective teeth bleaching. Our cosmetic dentistry patients can’t believe how great their teeth look once all the stains are gone. If you would like to schedule an appointment, call our office today. Our dental patients with new, beautiful smiles know about the latest cosmetic dental procedures we use, here at the Yuma Dentist. In this post, we’ll describe a few of them. At the Yuma Dentist, we stay ahead of the curve with the latest in dental technology. This includes teeth whitening techniques, porcelain veneers, and implant-anchored dentures. It includes digital X-Rays, too. Digital imaging is not just for Instagram, Tumblr and Pinterest. Realtime digital X-Rays we use at Yuma Dentistry help us more easily spot and treat oral problems, including emerging cavities and bone recession. Digital X-Rays require far less radiation exposure than previous X-Ray technology, and are easier to store and access. Pinpoint-precise Diode lasers are used in myriad procedures including crown lengthening, root scaling, biopsies, root canals, teeth whitening, oral lesion removal, and treatment of dental decay. Laser procedures are easier on the patient and require shorter healing times. The future of dentistry is here today, at the Yuma Family Dentist. 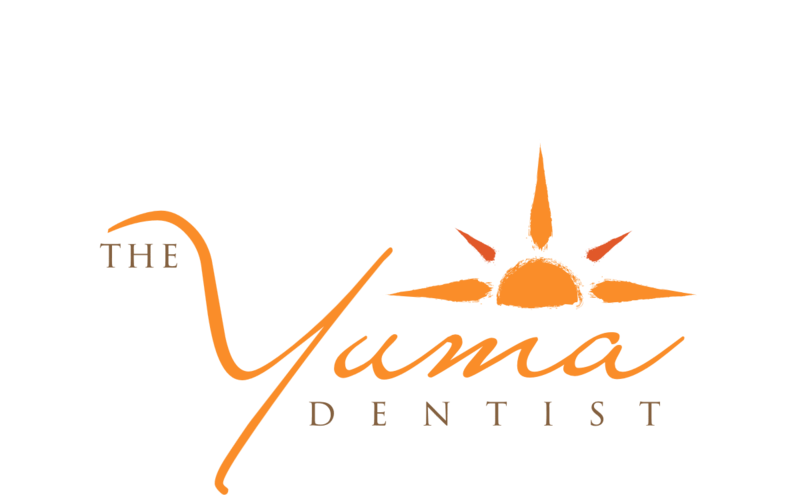 Welcome to the Yuma Family Dentist dental blog, Yuma! I’m Dr. Franklin Hulme. Today’s post focuses on teeth whitening. Unfortunately our teeth lose their luster as we grow older, but I see staining on young patients, as well. It’s safe to say people of all ages want whiter teeth. To protect from staining, it is important to brush after meals to remove substances that can stain. After consuming acidic foods or drinks, however, it is better to rinse your mouth with water to dilute the acid. This will protect your enamel. Tooth whitening products like kits, strips, whitening mouthwashes, and toothpastes can lighten stains slightly, but for a truly stunning smile, Yuma Family Dentist is your brilliant solution! If you have existing dental work such as porcelain crowns, dental bonding, or veneers, the whitening process can be trickier, but not impossible. Teeth whitening will not lighten the stains on your restorations and your whitened natural teeth will make your dental work look even duller in comparison. At Yuma Family Dentist, we can upgrade your dull restorations including veneers, crowns or bondings. In-office teeth whitening takes about an hour and bleaches teeth to a whiter-than-ever brilliance. Professional take-home whitening kits are also available at Yuma Family Dentist and can produce remarkable results over time. For more information on getting a younger and brighter smile, contact our friendly team at 928-783-0804 for a tooth whitening consultation today! Yuma Family Dentist provides general and cosmetic dentistry including cosmetic dentistry, sedation dentistry, and dental implants. Ask us about financing options. Teeth whitening has become very popular as an affordable, simple way to enhance your smile with little effort and no pain. Yuma Family Dentist can help you understand your options for teeth whitening and the improvements you may expect from various teeth whitening options. Over the counter whitening systems can give varied results, with many users not comfortable with over-the-counter teeth whitening products. Your cosmetic dentist can help you whiten your teeth effectively and realize professional results. If you are ready to try a teeth whitening product, please give us a call at 928-783-0804 to schedule a teeth whitening consultation. If you are searching for quality, friendly dental care in the Yuma area, call us here at Yuma Family Dentist. We are currently accepting new patients at our comfortable, state-of-the-art dental office. We are committed to providing superior dental care to our valued patients. Your teeth naturally lose luster over time. Dark-colored foods and drinks speed up the process, but even people who avoid coffee, wine and cola are not immune to yellow or gray teeth. Want to brighten up your smile? Teeth whitening at Yuma Family Dentist is one of the quickest and most affordable ways to look younger and more attractive. Though some patients experience a little short-term sensitivity, most experience no pain at all. There are several different methods for whitening teeth but each uses a solution containing peroxide to remove the stains that have accumulated in the microscopic cracks in your tooth enamel. First of all, the strips, mouthwashes and paint-on whiteners use a lower concentration of whitening agent than in-office methods. They rarely remove all of the stains on your enamel. If you have gum disease, cavities, crowns, dental bonding, or porcelain veneers, Dr. Hulme recommends that you come in for a teeth whitening consultation. You are always better off having teeth whitening performed by a professional. This will protect your existing restorations and ensure the best possible results. Don’t assume that tooth whitening offered at Yuma mall kiosks is risk-free. The industry is largely unregulated and the staff often have little dental training. Do you really want to take chances with your smile? At Yuma Family Dentist is currently accepting new patients. Our friendly team of skilled dental professionals would love to serve you with cosmetic dentistry, dental implants, sedation dentistry, teeth whitening, or Invisalign. You can schedule an appointment by calling 928-783-0804.